Husband and I agree, Greer is hands-down the healthiest eater in our house. Everything she takes in is 100% all-natural. Of course, she is a baby, and what would anyone expect other than the healthiest eats for her? 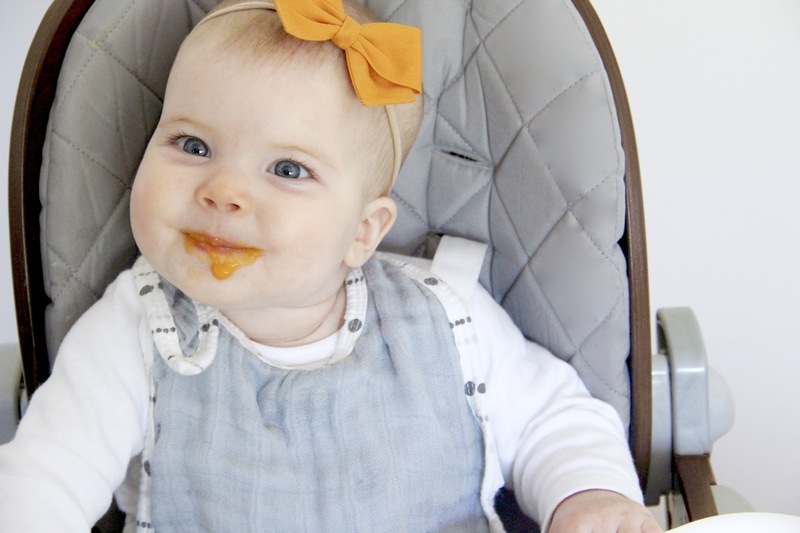 Feeding our babe healthy and nutrient-rich food is one of our big musts as her parents. It's important to us that she eats what's best for her growing body. At 5 months and a week, we introduced her to her first solid food, rice cereal. She loved it! Since we have slowly tried new foods. We started with jar purées to determine if she would have any kind of allergic reaction, and now that we have made certain she tolerates basic fruits and vegetables, we are gearing up toward making all of her food ourselves. 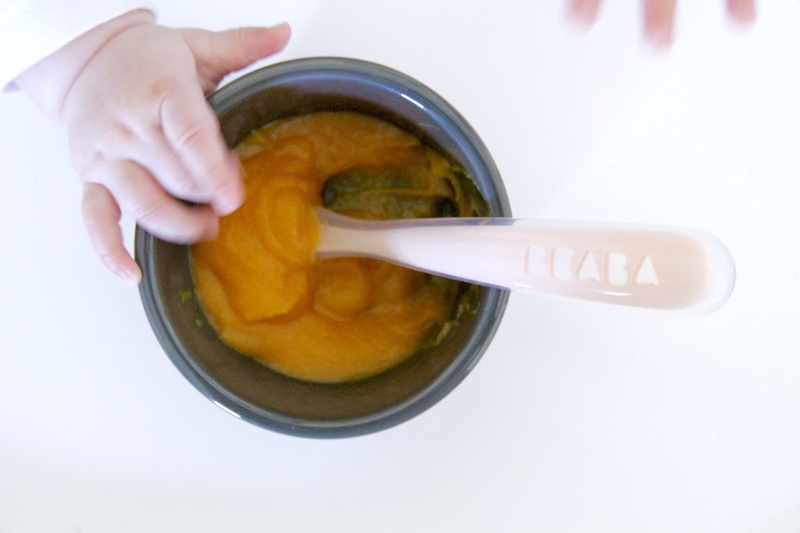 During our pregnancy we decided making our own baby food would be best for so many reasons, including Greer's health and our budget. By making our own purées at home we guarantee that she's getting fresh food and that it's full of needed nutrients. 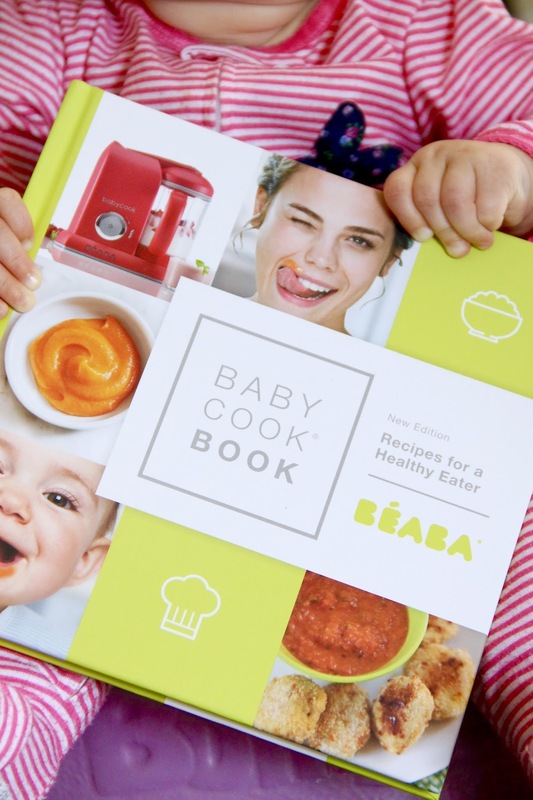 So when Béaba reached out to me about trying their Babycook at the brink of Greer eating solids, I couldn't resist. It was perfect timing. 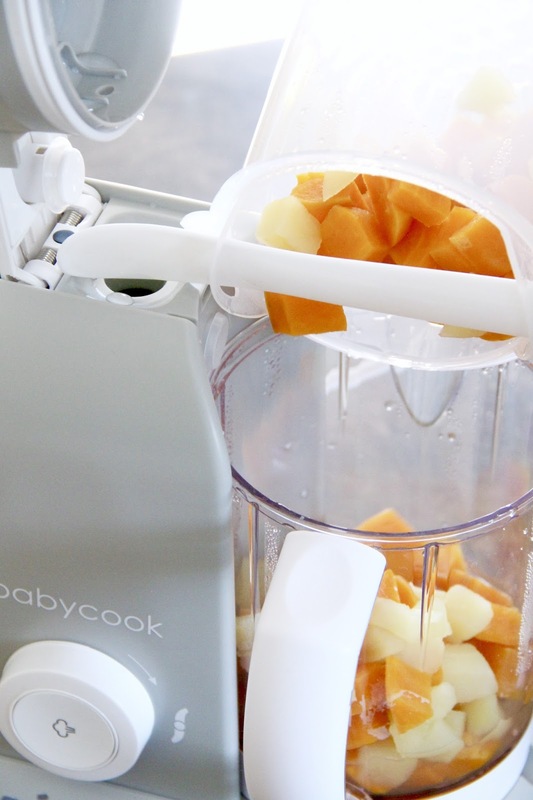 So yesterday, husband and I put together our first ever purée, and Babycook made it SO EASY! 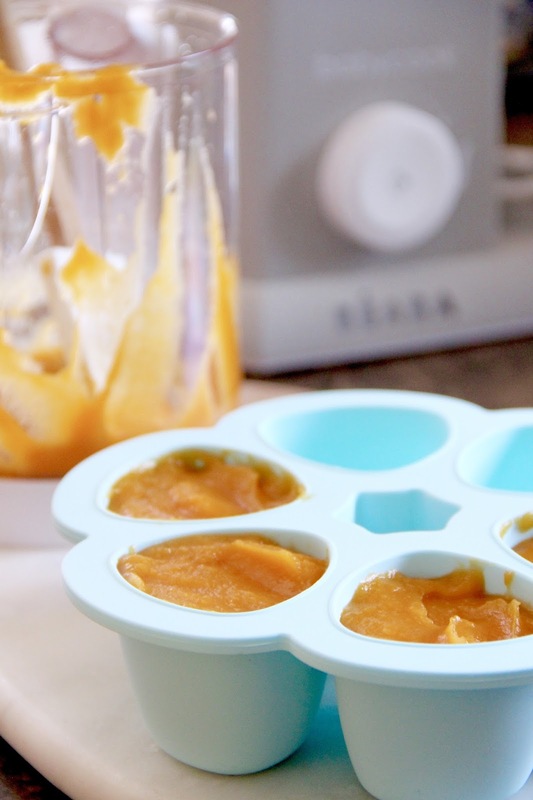 Part of me was dreading making baby food at home, because of the hassle I imagined it would involve. But y'all, that Babycook is a do-it-all kind of machine. 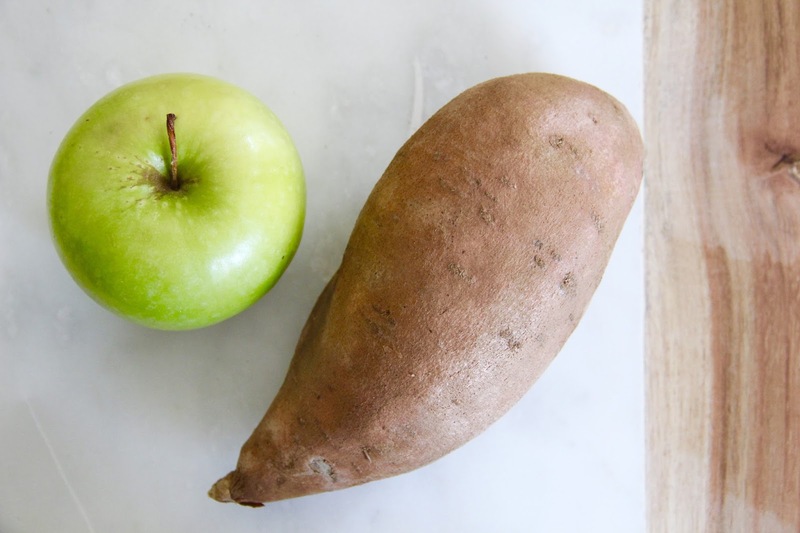 The only thing we had to do was peel and dice up the sweet potato and apple. We added the needed amount of water, put the food in, and pressed a button. Within 15 minutes that food was steamed and ready to be puréed. With a quick dump of the food out of the steamer basket and into the bowl, we blended the food up quickly. No mess, no hassle, and nothing but ease. As a mama with not a whole lot of extra time on my hands, this was a dream. Best of all Greer girl loved the sweet potato + apple purée! I really can't wait to try out new food combinations for her. 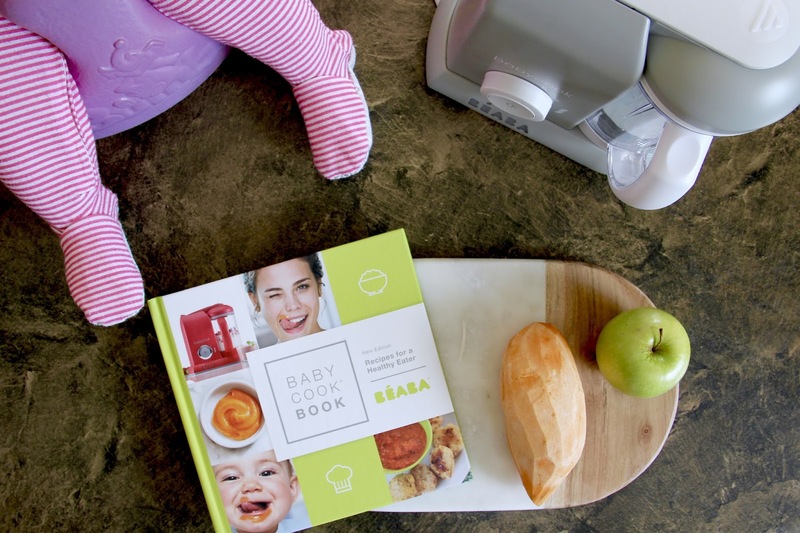 And the Béaba cookbook has a ton of inspirations for recipes. I'm most excited to try out their purées for when she's a little older. 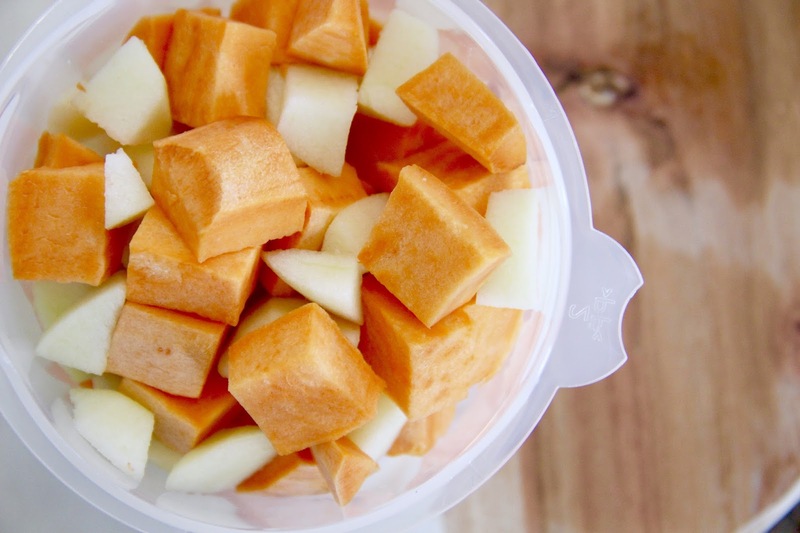 Peel both the sweet potato and apple. Dice them into small chunks. Fill the Babycook pitcher up to line 3, then put the water into the Babycook reservoir. Place the chunks into the steamer bowl, which goes into the pitcher. Close the lid. Press the steam button. This takes approximately 15 minutes. 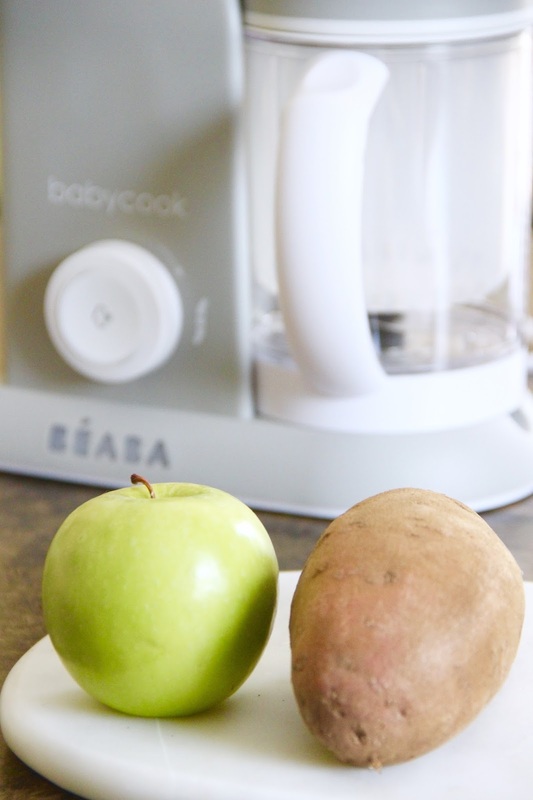 Once the steaming is done, use the Babycook spatula to dump the steamer basket contents into the pitcher. Cover with the lid. 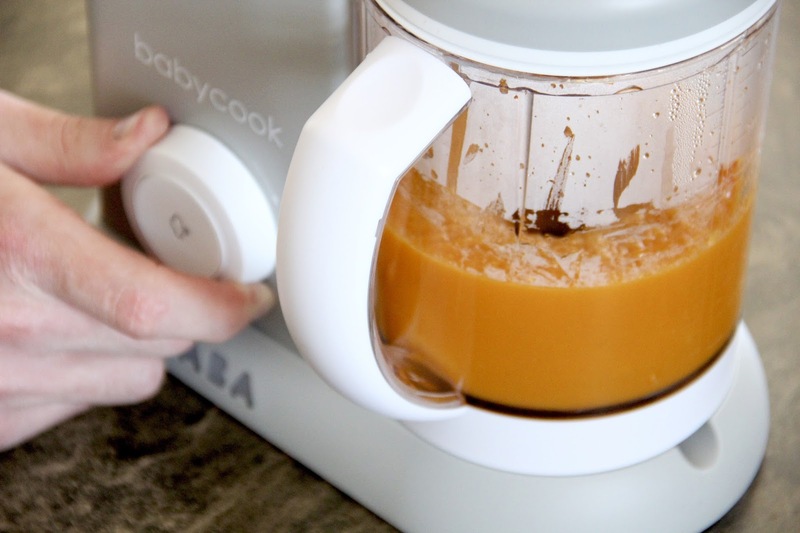 Blend the food 5 seconds at a time. 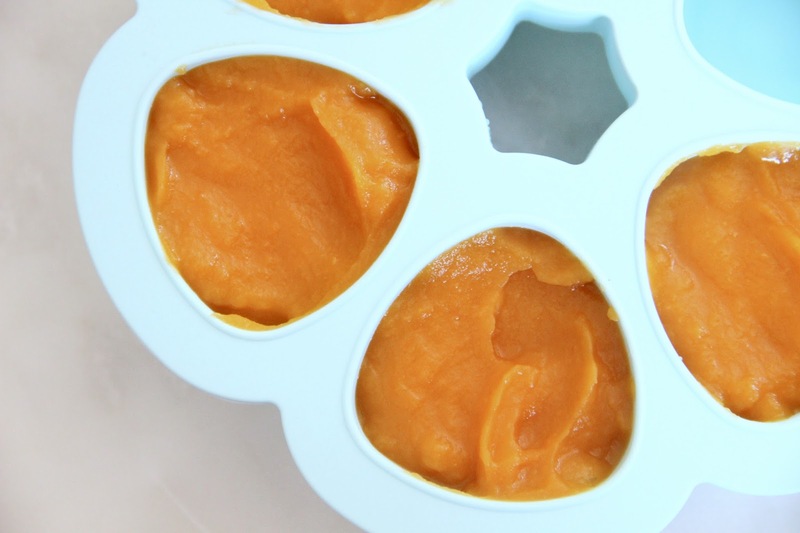 Purée to desired consistency. Let cool. Store the food in the multiportions food storage tray (which can be used for baking too!). Cover and refrigerate for up to 2 days or put in the freezer. This truly was such a simple process, and like I said, Greer loved the purée. We got it to just the right consistency for her liking. There were no chunks or uneven texture to be found. Perfect for a seven month who is learning to eat solids. My favorite part of the Babycook, besides the simplicity, is that it will grow with Greer. We can make a ton of meals for her, becoming more complex when she's ready to take on hardier meals. 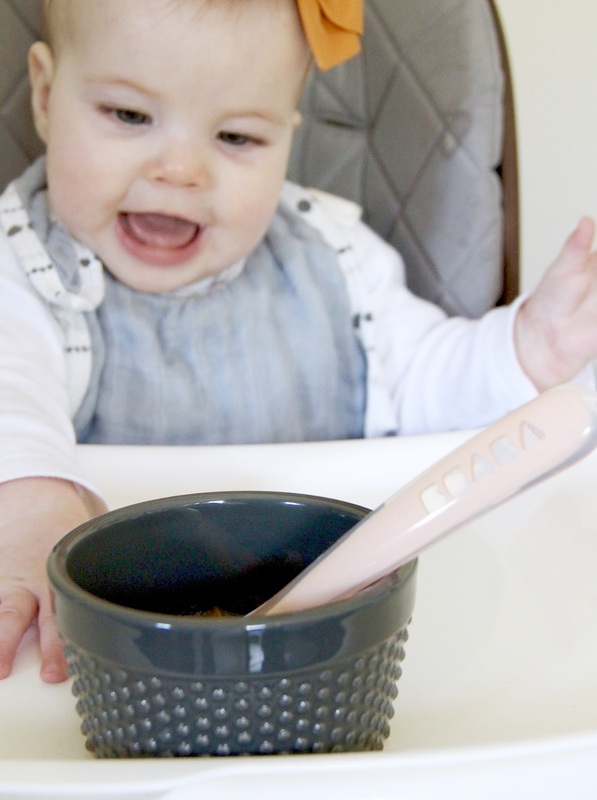 If you're thinking about making your baby's food at home, I say DO IT! You'll save money while ensuring your little one is getting all they need in their diet. And if you're going to make the food, make it easy on yourself too. Invest in a Babycook. We are so very happy with ours, and couldn't speak more highly of it. The giveaway will end Tuesday, July 26 at midnight and a winner will be announced that week. All entries will be verified. Be sure to use HILLCOLLECTION on your next Béaba purchase to receive 5% off and free shipping on orders of $50+. This post is in collaboration with BEABA to bring you both the giveaway and the discount code above. By using the discount code on your next order, I will receive a small commission. I was sent product from BEABA in exchange for my honest review. As always, all opinions are my own. Some affiliate links were used with this post, which means that I may make a small commission from them if clicked. Thank you for supporting Hill Collection!